I was reading a book from master coach Pat Riley entitled The Winner Within. This book has been around for a number of years (1993) and Coach Riley discuss his philosophies that make up a successful team. Coach Riley knows what he’s talking about – he’s was at the helm of the 1980’s LA Lakers World Championship basketball teams, the New York Knicks and the 2006 Miami Heat championship team. Most of us belong to some sort of team. And while we may not always get on with others, we are some what reliant on others doing their job, playing their role. Its no different from testing. Whilst we may be perceived as being negative (‘Your job is to break the system’), we still play a vital part. If we then are able to look at the big picture and synergise with the (project) team as a whole then we are able to produce quite effecient results. You see this all the time in sports where a very talented team just can’t seem to get it together. I once coached a basketball team that, individually, were quite brilliant for their age group. But as a team they just couldn’t take the ‘I’ out of team. A championship team (or for that matter a good team) is a team that is able to synergise well together – their is no ego only healthy respect for each other. BA’s working with Testers and developers in harmony to produce something extraordinary (one government department i worked for worked exactly like that and yet another didn’t because there was a wall between the testers, BA’s and developers – literally and figuratively). 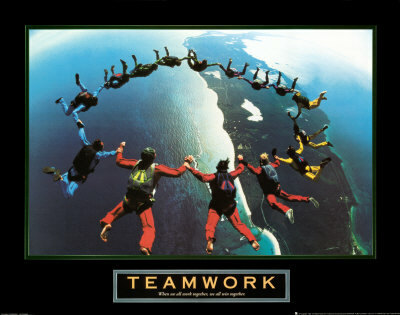 One of the ways to build this teamwork is founded on trust. It drives us, it helps us, it builds confidence in each other and in others. It enhances who we are and yet at the sametime if we trust and are trusted then we are more likely to ‘build up’ then tear down. A divided house cannot stand.